Applications for the Frank S. Westling Scholarship and the Columbia College–Kansas City Scholarship are now available for students. These scholarships are a great opportunity to earn both money and recognition for academic success. 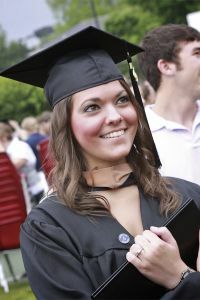 The $500 Frank S. Westling scholarship can be applied to tuition, books and fees for the 2011-2012 academic year. To be eligible to receive this award, a student must be currently pursuing a Columbia College baccalaureate degree and have earned at least a 3.0 cumulative GPA with Columbia College. Applicants must have completed 15 hours of Columbia College residency credit and have attended during the 2010-2011 academic year. No applicant can be in default of any loan made under the Stafford, SLC, Plus or Perkins Loan Program. The application process includes a 400-500 word essay addressing career goals and leadership and/or community service achievements. Applicants must also submit documentation of leadership and/or community service achievements, such as letters of recommendation, awards or news articles. The application deadline is March 15, 2011. The faculty, staff and friends of Columbia College–Kansas City established an endowed fund to support students attending the campus. This fund is designed to provide an award to one student attending the Kansas City campus each year. The individual selected will receive a one-time $500 award which is only to be used for tuition to Columbia College. The award will be given during the 2011 August Session. To ensure that the maximum number of students benefit from these awards, each recipient may receive the Kansas City Scholarship only once during his or her college career at Columbia College. Recipients of the scholarship must be currently enrolled and pursuing a degree at Columbia College and have completed at least 12 semester hours at the Kansas City campus with a minimum GPA of 3.0. Also, recipients must have demonstrated financial need. The application process includes a 400-500 word essay noting evidence of financial need and a description of career goals, leadership and/or community service achievements. The due date for the applications is April 29. For more information, or to pick up an application for either of these scholarships, visit the Columbia College–Kansas City office.